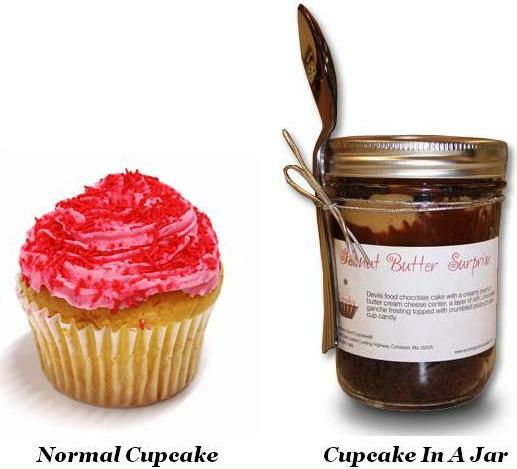 In response to the TSA confiscating a “cupcake in a jar,” the Silver Spoon Bakery in Rhode Island decided that they could make the world a better, sweeter place with their TSA compliant cupcake. In addition to looking delicious, the cupcake is guaranteed (by the bakery, not the government) to pass swiftly through security checkpoints. Its secret? It contains exactly three ounces of icing, which the TSA classifies as a gel, and it comes in its own clear baggy. It’s worth noting that the original, confiscated cupcake was taken by the TSA on the grounds that it violated the three ounce rule for carry-on gels. That may sound ridiculous, but as you can see in this image provided by the TSA, the confection on the right, though delicious, is not your normal cupcake. The issue, it seems, wasn’t so much that it was a cupcake or a re-imagining of a cupcake, but that it was more than three ounces. In order to comply with those rules, the Silver Spoon took a tongue-in-cheek approach and followed the rules the TSA has issued for shower gels and the like. Hence the ounce limit, and the clear plastic bag. The accompanying image of former President Richard Nixon and cupcake boarding pass are just for fun. The cupcake retails for $4, which is a small price to pay for security.